The Santa Clara Valley Transportation Authority Thursday unveiled five all-electric buses expected to roll out in May. Elected officials and representatives from partners of the project gathered at the VTA Cerone bus yard in San Jose Thursday to talk about the concept, design and execution of the buses as well as their use in meeting California's statewide goal for all transit fleets to have zero emissions by 2040. The buses, which are charged through a new pilot system designed by Oakland-based Kisensum to reduce the impact on the state's electricity grid, are anticipated to run through a number of routes starting in early May, according to the VTA. One of the test routes will be the Airport Flyer, or Route 10, which is a free airport connection from the Santa Clara Transit Center to the Metro Airport station located at Mineta San Jose International Airport. The emission-less buses are 42 feet long, have 40 seats and can travel around 200 miles on one charge. They take an estimated eight hours to charge on ChargePoint machines, but VTA will upgrade to next-generation DC fast charger later this year. ction provided by supplier Clever Devices tracks the amount of energy buses use while in operation and provides dispatchers real-time information about that usage and predicts the amount of energy needed to complete the day's work plan. The buses also have batteries that are "regenerative," which means that they get re-charged during the act of braking, an asset that VTA's hybrid buses have too. The charging pilot project will act as a major case study for transit agencies across America and the research driven will be handled by the National Renewable Energy Lab based out of Colorado. Mayor Sam Liccardo said he believed that the buses will help local efforts to try to make green options available to everyone. 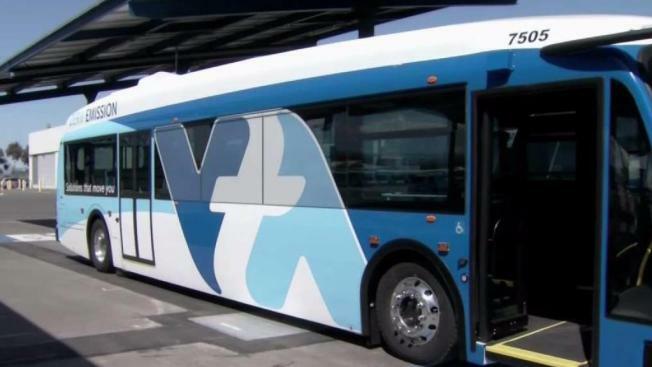 VTA confirmed that the cost of the new buses, which average $925,000 each, will not impact fare prices. The initiative is paid for by a grant offered by the California Energy Commission for researching energy management for large vehicles. Proterra Inc. CEO Ryan Popple, whose company manufactured the buses, said that his company "invested heavily" in the project because they believed in the vision of giving everyone access to electric vehicle technology. "The opportunity to give this to every single person in the community who wants a clean, healthy ride ... that's what this is all about," Popple said. "We thought, 'What vehicle technology is the most accessible?' but also 'What vehicle technology is going to be the first to electrify?' Buses are the best place to start." The VTA's current plan is to add more of the buses, made in City of Industry, California, in the coming years until their entire fleet is electric. Right now, an estimated 75 percent of VTA's buses are diesel hybrid electric, but that number will be lowered when five more buses are anticipated to be added in 2019. The life expectancy of the buses is expected to be just as long as diesel, which is approximately 12 to 15 years, VTA officials said.